Hi guys! Here is the first post of my third Swatching Plan. Mind Control is a black jelly with magenta shimmer. I used 3 coats for the pic, plus 1 of top coat. Pictures taken in my light box. I only use Mind Control once before and it was for these Tweed Nails. Power Thief is a gorgeous brown with silver shimmer. I used 2 coats for the pic above, and 1 of top coat. I previously used Power Thief in this manicure (old pics sorry!). Clairvoyant, previously released under the name Unicorn Puke, is a blue jelly with vivid blue, red/rust and green flakies. I used one coat over Time Traveler for the pic, and one of top coat. Pictures taken in my light box to minimize the annoying light reflections. Overall, I'm so thrilled with this collex ♥ Clairvoyant is obviously amazing, Time Traveler is one of favorite blues and Power Thief is so beautiful. Only Mind Control is not really a polish for me... but that is a wonderful collection and I'm glad I bought it! What do you think of this collex ? Which one is your favorite ? 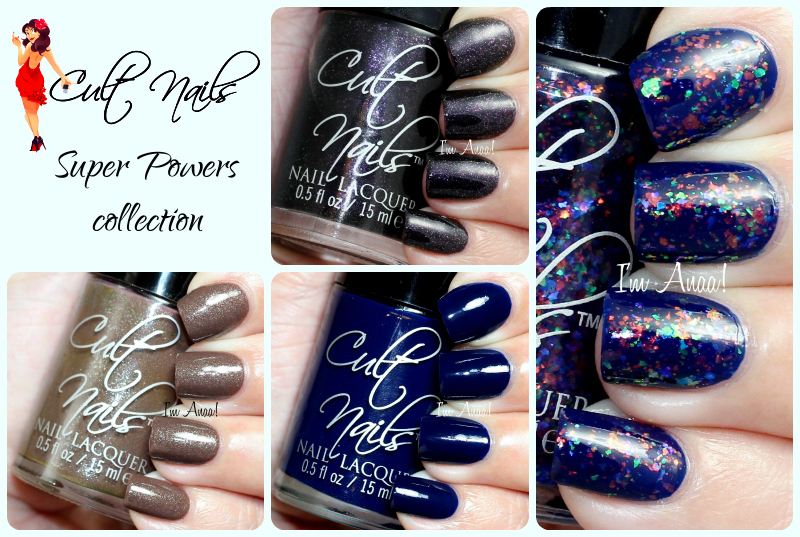 Power Thief and Time Traveler are still available for purchase on cultnails.com. They retail for $12 each.